Home / The Archives / Happy Holidays! I’m very proud to be a part of the Commute by Bike family. Read this little snippet from a recent e-mail I received from Moe, which I’m sure he never meant to be published. Moe really sums it up. RL, Priscilla, Moe and myself, truly love cycling, and we do our best to give honest, candid, and forthright reviews of the various products we test. We, being “regular folk”, then share our findings so other regular folk can make more informed decisions on their purchases. By cyclists, for cyclists, 24/7/365, and it never costs you a dime! 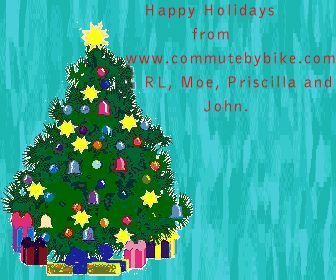 A Merry Christmas to all, and to all a good ride!